little red wagon: Little Red Wagon Challenge #377- Thank You! Hello again! This week I am hosting our challenge here at Little Red Wagon. The theme is Thank You! Let's see all your projects sharing some thanks! You can use the link below to post your project. I will post my favorites next Tuesday. If you are chosen, don't forget to grab a badge for your blog. For my card I used a Stamping Bella stamp called Ramona and her wagon. The words are from a Penny Black stamp set called Special Thoughts. Hello all. We had a little problem with Mr. Linky....so we just popped in another link up. All makes, no matter which link up was used, will be considered for the Featured Project of the week. A lovely card from Donna, thanks for a great challenge! I was going to post my card but the inlink has already expired??? 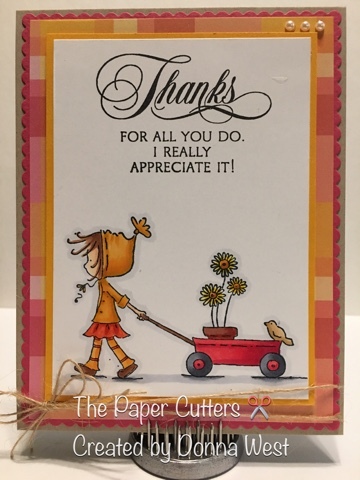 Love your sweet little card, Donna! I was about to post a card but the links are closed. Here's my card for the challenge. Oh no! I'm so sorry everyone! Let me find out what happened here with the link up! I'm so sorry for the mixup.